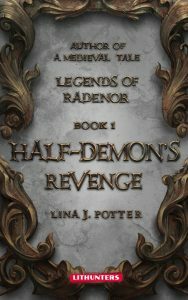 A new dark fantasy series by Lina J. Potter! The land of Radenor is in need of salvation: the royal family and the court are corrupt to their very core, full of vipers and backstabbers, the church is malevolent, the people are starving, and death has become a frequent guest of the poor and downtrotten. The land needs a new king, and Alex, a half-demon son of a princess, begins his way to the throne and revenge for his late mother’s fate. Lina J. Potter has been dreaming up stories for as long as she can remember. She started putting her tales on paper when she was around ten years old, and, according to her own words, continued happily scribbling ever since: “Call it inspiration, the voice of a Muse, or plain obsession… but I felt I had to write it down or else my brain would explode with all these characters longing to come alive”. However, Lina did not feel ready to share her writing with the world until recently, when in 2011 she submitted an extract from her historical fantasy novel, I am Sophia, to an online magazine. Immediately after, Lina J. Potter was approached by e-talent scouts representing publishers and other literary companies. Since then, there was no looking back for Lina J. Potter, who quickly turned into one of the most published and widely talked- about (yet least public!) romantic fantasy authors in the country. Her impressive publications list speaks for itself, and we are thrilled to announce that her first few bestsellers are now available in English. Nowadays Lina J. Potter lives in the town of Tambov with her husband, daughter and two cats. She has a light-hearted approach to writing. Whenever she is not writing, you can find her practicing karate and lace-making. She avoids personal publicity and shies away from the literary limelight, preferring her quiet life to focus on writing.